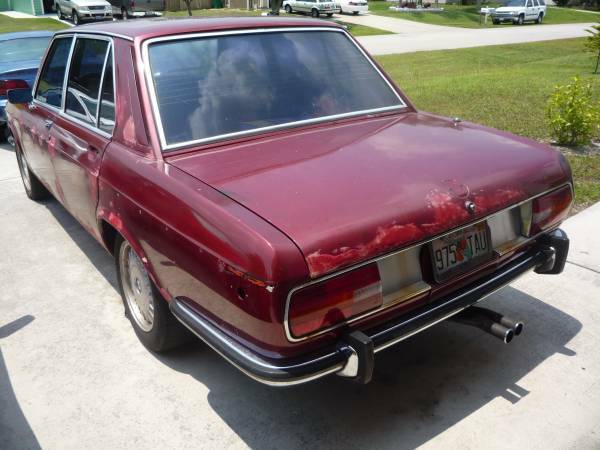 It’s been a while since a Bavaria has appeared here, so when a recent search yielded a running example, it was an automatic candidate for a write-up. These 7-series predecessors are finally getting some of the respect they deserve, much like other less desirable relatives of more popular cars (see Alfa Giulia TI/Giulia Super/Berlina, Dino coupe/spider, Porsche 912). So your former parts donor is now a source for more than parts – it’s a source of a similar driving experience at a more accessible cost of entry, and sometimes one you can more easily share with friends. 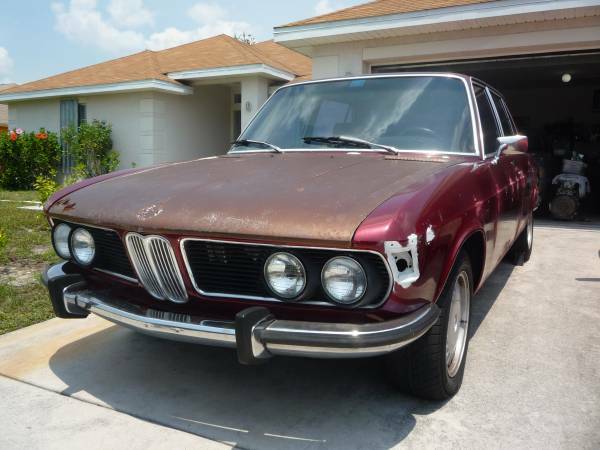 Check out this 1973 BMW Bavaria for sale for $2500 in Port St. Lucie, FL. 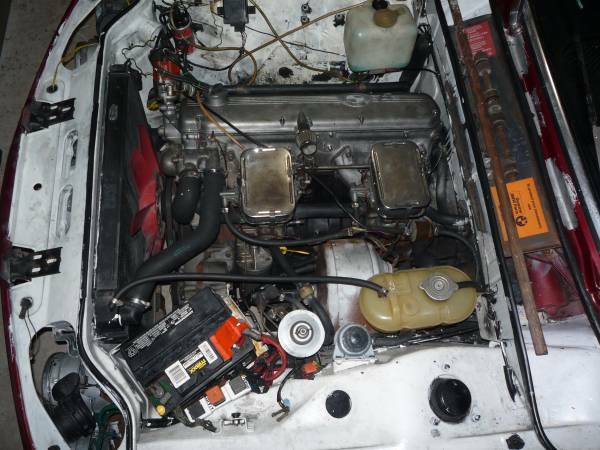 Clearly this car is something of a project, and in fact the seller says many parts are not yet installed. It’s not clear from the description what his intent was – did he plan for a full restoration, or just enough work to arrest the rust and make it into a rough and ready driver? The car is running and driving, and seems to be largely intact, so perhaps a rolling restoration would be the right approach here. The engine has been upgraded to a 3.5-liter version, but still has Weber carburetors instead of the expected fuel injection. There are many new parts, including starter, front discs, and various suspension and front end parts. It’s not clear why the engine compartment is white, although it looks to be some kind of primer and not the original body color of the car. That white also appears around the driver’s side front corner light. And here’s what you get in Florida – in addition to severe cracking of the horizontal surfaces due to heat and sun, you also get rust from the moist, salty ocean air. 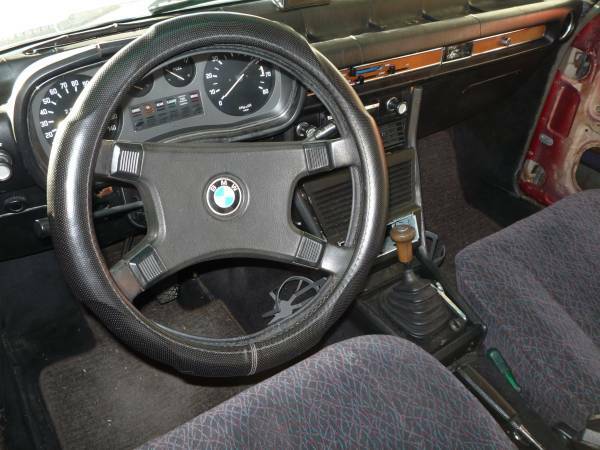 The wheel seems to be from a first-generation 6- or 7-series, and the seats look to be junkyard-sourced from a random Japanese car. The practicality of cloth seats is understandable when you think of the climate, but wouldn’t some seat covers have been better in this case? Of course, the original seats might have had poor covers and padding, in which case they’re nearly a lost cause. It’s clean enough back here, and the Malaga red is a good color on these large sedans. The exhaust seems to protrude a little far – is that your twin exhaust or are you happy to see me? The bumper also looks a little pushed in on the passenger side, so you’ll want to ask the seller. All that considered, as a rough-and-ready drivable project with hotrod power, it is definitely worth a call. This entry was posted on September 4, 2014 at 10:44 am and is filed under Feature. You can follow any responses to this entry through the RSS 2.0 feed. You can leave a response, or trackback from your own site. Your style is so unique compared to other people I’ve reead stuff from. Hello, I’m curious how you’re routing the vacuum to the double-sided vacuum actuator on your distributor?